"We want to know if stem cell therapy is an option for patients who have essentially run out of options. It's a very exciting potential therapy, and these studies are designed to see if it works to help these patients." said Dr. Adam Berman, electrophysiologist at the Medical College of Georgia at Georgia Regents University and Director of Cardiac Arrhythmia Ablation Services at Georgia Regents Health System. "Everyone's heart is different, their scar burden is different, everything is different." Berman said. From that vantage point, small needles - similar in size to those used for skin testing - are used to make about 12 to 20 strategic injections of mesenchymal stem cells, which can differentiate into a variety of cell types. In this case, researchers hope the cells will improve blood flow and function of the heart. Half of the study participants receive the stem cell treatment called ixmyelocel-T and the remainder a saline placebo. Patients go home the next day but researchers follow all participants for 12 months to assess heart function and quality of life. GR Health System plans to enroll a handful of patients in the clinical trial. Treatment options for heart failure include frontline therapies such as diuretics to more extreme measures such as implantable ventricular assist devices and heart transplants. Patients eligible for this trial have explored existing options and must have an internal defibrillator, a standard of care in these patients to help avoid sudden death from an abnormal heart rhythm. Sudden death and progressive heart muscle failure cause most congestive heart failure deaths. Before enrollment, a cardiothoracic surgeon and interventional cardiologist rule out other options to open the patient's coronary arteries. While much work remains, Berman hopes stem cell therapy may one day be a part of early intervention to help keep heart failure from progressing to an advanced, debilitating state. "We hope this is the future." he said. Laboratory studies at MCG and elsewhere indicate that stem cells injected into the heart typically survive only a week or two. "That has been a very debated point." 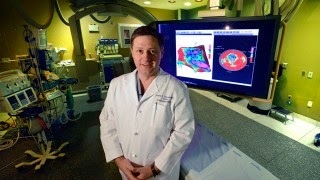 said Dr. Neal Weintraub, cardiologist and Associate Director of MCG's Vascular Biology Center. So while evidence is limited that many stem cells actually turn into new heart cells, good evidence exists that they can help generate new blood vessels to reperfuse the heart and secrete factors that aid survival of existing heart cells, Weintraub said. The sometimes dramatic change researchers see after injecting stem cells into the heart, at least in the laboratory, likely results from a combination of new and saved tissue, he said. "What they do is produce a lot of factors that change the environment dramatically and conduce the normal cells in the tissue to work better and potentially help them survive." Weintraub said. His laboratory studies stem cells endogenous to the heart to learn more about how they work normally and how, in the future, they might be used therapeutically. "If we can unlock the secrets, we might be able to teach the cells to do this repair on their own." Weintraub said. In fact, stem cells are found throughout the body, and while evidence suggests they already try to help repair damage, many patients have multiple related conditions, such as high blood pressure and diabetes, that prevent endogenous stem cells from working as well as they should, said Weintraub, who is a Co-Investigator on the new clinical study.